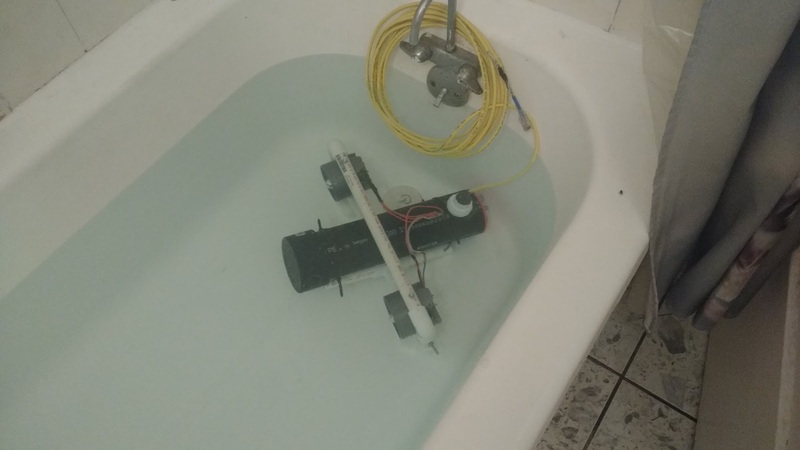 If you've read this blog for a while -- a long while -- you might know that I have been working on an underwater ROV on and off for more than a year. This is another update. The good is that last year, I had a crude body for the Remotely Operated Vehicle. It had propellers that were hooked up to a battery and spun. It had a microcontroller that told them when to spin. It had a Raspberry Pi single board computer to receive instructions over a USB tether and send them to the microcontroller. And I had a program that would read data from a joystick over a long USB cord. I finally thought that I just about had some kind of system I could put in water and drive around with a controller. The defining feature of an underwater ROV is that it goes underwater. Which means that the electronics need to be inside of a waterproof enclosure. And since radio waves don't travel underwater*, there needs to be a cable that passes from the user outside of the water, into the water, and then into the enclosure, without allowing water in. This turns out to have been another unexpectedly difficult challenge in a project literally made of nothing but unexpectedly difficult challenges. I struggled with this in the past when I tried to make waterproof connectors so that I could detach the motors to replace them, and in the end I settled for a work-around by passing wires through holes drilled in the enclosure and then slathering them in epoxy to make it water tight. I didn't like it, but I didn't want to just keep thinking and reading, so I did it. But when I tried to do the same with the USB cable, it didn't bond. This has been a recurring issue. Do you know what my random USB cable's insulation jacket is made of? Do you know what bonds to it? Neither do I. So instead of wasting more time guessing and checking with different epoxies that promised to bond to anything, I took a step back and decided to make a tether out of a known material, and find an epoxy that bonded specifically to that material. I bought an CAT6 Ethernet cable with a PVC jacket and a PVC-bonding epoxy. And since I was putting in the effort, I decided to try again at making a detachable connection by buying a PVC union made for securing watertight connections, and I bought 8-pin DIN connectors like the kind used in old-school analog audio equipment. It looked pretty good. The good news is that after over a year working dry, I finally got something wet. Unfortunately, as expected, it didn't hold a seal. After 24 hours in the tub, about 4 mL of water seeped in. Honestly, though, I'm delighted. After a long period of confusion, I think I've got a set of plans for proceeding. I'm going to build mini test enclosures and confirm each seal one-by-one. The glued cap. The removable gripper cap. Then the PVC union and the glued holes.